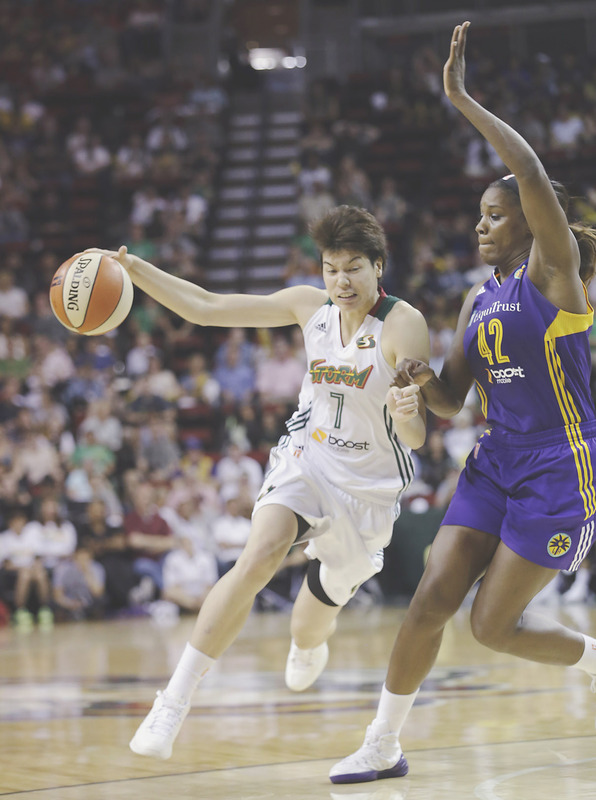 Despite her team’s poor start, Seattle Storm forward Ramu Tokashiki has been a bright spot for the WNBA club in the early going this season. The 191-cm forward, who signed with the Storm in April, had consecutive season-high scoring performances over the weekend. On Saturday, the 24-year-old Tokashiki scored 14 points on 7-for-13 shooting in a 73-71 road loss to the San Antonio Stars. She also played a season-high 31 minutes on the night. A day later, Tokashiki, who has made one start, poured in 21 points on 10-for-15 shooting in 23 minutes in a 93-89 defeat to the Tulsa Shock. Her big performance included a game-tying baseline jumper with 33 seconds left. She also blocked two shots. Previously, Tokashiki’s top scoring game was an eight-point effort on June 9 in the team’s second contest this season. The Storm (2-7), losers of five straight games, sit in fifth place in the six-team Western Conference. Seattle was scheduled to return to action on Tuesday night at home against Tulsa. 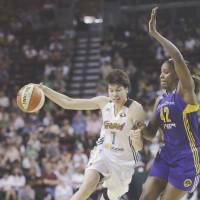 A WNBA insider who attended both Storm games over the weekend believes Tokashiki has a bright future in the league. In an exclusive interview with The Japan Times on Monday, the source said, “She seems to be bonding with her teammates pretty well. She will be a great player in the near future. Before joining Seattle, though, the rising star had a track record of success. Tokashiki, who starred for the WJBL’s JX-Eneos Sunflowers from 2010-15 and led the club to four titles, was the leading scorer (17.1 points per game) during the FIBA Asia Championship in 2013, helping Japan capture its first tournament gold medal since 1970. During a sensational 2014-15 campaign, Tokashiki averaged 18.0 points, 11.5 rebounds and 2.1 blocks, leading the WJBL in all three categories. Tokashiki, a native of Saitama Prefecture, is averaging 7.0 points and 18.9 minutes per game for the Storm. What does the 79-kg Tokashiki need to focus on to improve her all-around game? “She needs to work on her strength,” the WNBA insider said. Lack of strength is her weakness, the source pointed out.